Manual handling injuries are the main cause of lost working days in the UK. These injuries occur due to sprains and strains resulting from the incorrect lifting and movement of objects. In accordance with the Health and Safety at Work Act (1974) and subsequent Regulations, it is the responsibility of all employers to provide employees with sufficient information and training on manual handling. By training an employee to achieve a manual handling qualification you have an effective way of ensuring that you have taken the necessary due diligence to ensure your staff are adequately trained. The Manual Handling Course will help employers comply with the Manual Handling Operations Regulations 1992. 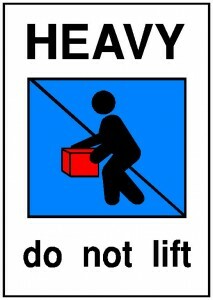 It is aimed at employees who are involved in regular lifting. The course enables students to plan lifts and carry out correct lifting practice, by following basic manual handling techniques. The adherence to these principles will reduce injury, absence from work, and may reduce the risk of litigation. Manual Handling is lifting, lowering, carrying, pushing and pulling loads. The course also provides information on the human spinal system, risk assessment, the legal responsibility of employers and employees along with techniques for the prevention of accidents. The course involves knowledge development, and a series of practical exercises, followed by scenarios that allow the students to put their skills into practise. Participants are required to complete the practical exercises and scenarios prior to certification. Certificate is issued on successful completion of the course. Manual Handling Skills should be refreshed at regular intervals. Prices– Please give us a call for up to date prices and group discounts.